Internal carotid artery: This artery branches from the common carotid artery in the neck. It passes through the carotid canal in the temporal bone to enter the cavernous sinus where it serves the pituitary gland and trigeminal ganglion. It supplies most of the blood to the anterior part of the brain and participates in the circle of Willis, which is a circle of communicating arteries (anastomosis) at the base of the brain. Anterior cerebral artery: Coming from the internal carotid artery, this artery brings blood to most of the cerebral hemispheres (but not the occipital lobes). It also forms part of the circle of Willis. Middle cerebral artery: This artery comes from the internal carotid artery and serves the lateral surfaces of the cerebral hemispheres. 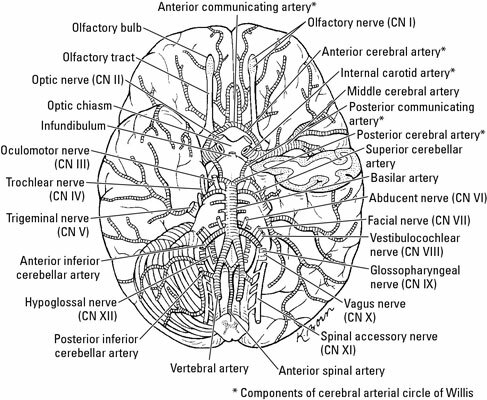 Anterior communicating artery: Connecting the two anterior cerebral arteries, this artery also forms part of the circle of Willis. Vertebral artery: This artery starts at the subclavian artery and travels up along the cervical vertebrae to bring blood to the meninges and cerebellum. Posterior inferior cerebellar artery: This artery branches off the vertebral artery and serves the inferior part of the cerebellum. Anterior spinal artery: The right and left arteries stem from the vertebral artery and anastomose (join together) and run to the spinal cord. Basilar artery: This artery is created by the union of the left and right vertebral arteries. Anterior inferior cerebellar artery: This artery starts at the basilar artery and runs backward to the anterior part of the cerebellum. Superior cerebellar artery: This artery branches off the basilar artery and supplies blood to the superior surface of the cerebellum. Posterior cerebral artery: Stemming from the basilar artery, this artery serves the inferior parts of the cerebral hemispheres and the occipital lobes. It’s part of the circle of Willis. Posterior communicating artery: This artery connects the posterior cerebral artery with the internal carotid artery. It also forms part of the circle of Willis. An ischemic stroke happens when blood flow is cut off to part of the brain. It may cause neurological deficits and even death. This type of stroke is commonly caused by blood clots in the arteries that supply the brain. Hemorrhagic strokes occur when a blood vessel ruptures due to an aneurysm, which is a weakened dilatation of the blood vessel wall, or cerebral or subarachnoid hemorrhages. High blood pressure increases the risk that an aneurysm may burst.